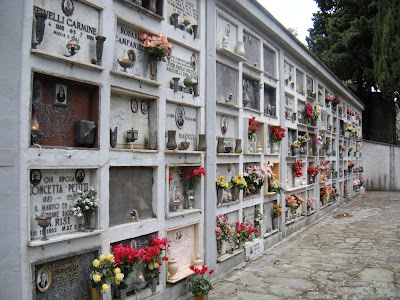 The cemetery in Faeto. Full of our family. I may not be the best historian, but all of you are doing a great job. I have saved every email and compiled all kinds of information. In the next few days you will find a tab for Faeto documents, photos and perhaps some names so I connect some of you. It is rather apparent that there are three distinct Petitti groups that came to the US from Faeto. The Connecticut/East Coast, the Ohio Area and Chicago. I am happy to add any of your trees, photos, etc to this blog and give contact info if anyone is interested. Also send along any reunions that may be of interest. Because the Faeto community is so large, I will concentrate mainly on the Petittis, but please contact me regardless, because I may have leads on your last name. Since my last post, I have met an unknown relative. His grandfather and my great grandfather were brothers. They dropped the i and made an e so Petitti to Petitte. How cool is it to think that 150 years after my great grandfather's birth I would find a cousin (is he my cousin? I never know these things!) Bob Petitte and I had dinner with a group of relatives and shared pictures and will stay in touch. He is also a die hard Cubs fan. I have also met online a researcher that is out of this world. She has a family tree like I have never seen. 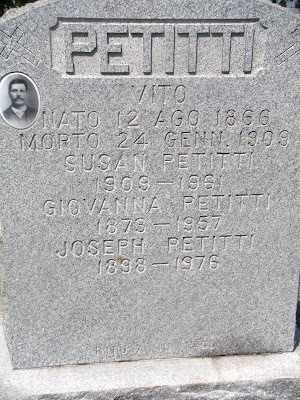 It branches off to her family when a female Petitti marries a Melfi, but it starts with Domenico Petitti who was born in 1775. Yes, think about that. so I am lucky enough to have her tree to the early 1900's. It's a treasure, and loaded with Petittis. So far I can make no direct connection, but I think I found a lead and will be working on it for sure! Her short version is under one of the pages. The long version from the 1700's is a bit bigger! I also lost someone very special to me. 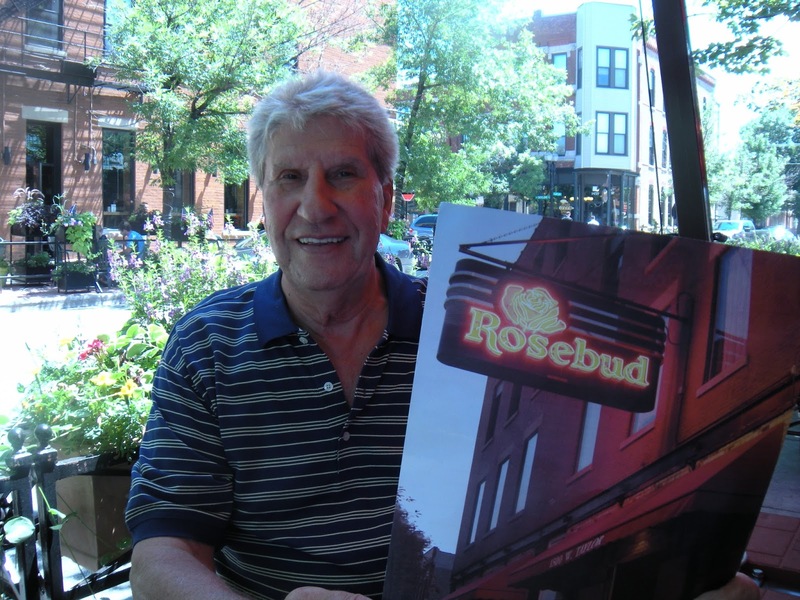 My Uncle Mike Carosielli was my personal driver all over Chicago. He was game for any of my hair brained ideas! We searched cemeteries for relatives (and circus acts), we wandered Mt. Carmel, Taylor Street, and North Avenue, and ate amazing food along the way. He drove like a Chicago cabbie and I felt safe as can be sailing through the old neighborhoods and listening to his stories. I am so blessed to have struck up a friendship with him over the last years and I miss him terribly. 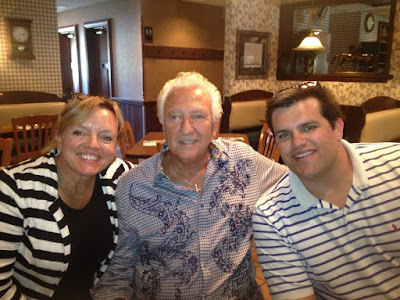 Through these old blog posts, my son and I met up with another relative in Mt. Carmel cemetery and found our families quite close. His grandmother and my grandfather were siblings. We went to his home and there on his wall are the exact photos I have of my grandfather's meat market on Taylor St. His grandfather bought it! And then there is the email with the funeral book. The names and addresses written in the hand of my relatives. The huge number of people who remember their relatives going to Patsy Petitti's farm in Dundee. My Grandpa's farm. It was sold and became Chateau Louise and a few of my readers have many memories there. So much information. So much. Read. Enjoy. Contribute. Share. Finally, I have to say that some of you may have found me at SweetiePetitti.com That is another passion, the kitchen. Please, I beg you, share your family recipes with me. Let me cook the food of our families! When my grandmother passed, my aunt took all the lady things. She never married, and when she died nothing was ever found of those personal effects that I know of. So if you'd like to talk food, feel free! It's one of my favorite things! I promise to keep up to date! The following is a post from SweetiePetitti which is where many people come to find Faeto. I decided to copy the post here as well, and hope that we can start getting comments, names, places here. As you will read, I have many comments already, and I would really like to hear from Narcisi again, I am certain we are related. I think her grandmother Rose was my Great grandfather's sister. Please add your info in the comments section, it is a great place to begin to gather information! Happened upon your site via some family research! 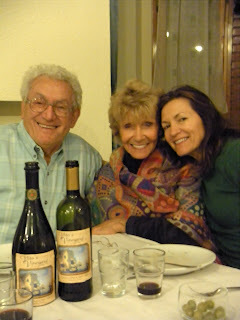 I have ties to two Faeto families...my great-grandmother (a Petitti) married a Degirolamo-both from Faeto! Loved the pictures. I hope to visit someday too! My ancestral home is also Faeto. I am a DeGirolamo, however my paternal great-grandmother was born Vincenza Petitti. My mother was of Croatian heritage from the Gorski Kotar region. Twice I made the Faeto and Croatian/Bosnian pilgrimage and my daughter wants to take me back once again next year for my 60th b'day! Very interesting blog and I'll check back time to time. It was my hope that people searching Faeto would stumble here. I am sure M.A. DeGirolamo that we are somewhere related, isn't that amazing, that tiny little town.....I am certain with your Croatian and Italian blood you must even look like my family! I stumbled across this site by accident. My parents are from Italy too. My mom's maiden name is Altier and my father is Spinelli. After not being there as a kid the summer of 1990, I had the opportunity to take my wife and 2 sons back to Italy to see some sights in Rome, Florence, Assissi, Pisa & Venice. We spent the last 2 1/2 weeks in Faeto with my uncles, aunts, & cousins. It was great to see my kids bond with their relatives they had never met. Words can't describe how well we were treated and how my wife and kids were welcomed like they had always been a part of the family. This is a very nice site. Thank you for sharing it. My great grandparents on my mother's side were Carosina "Rose" Petitti and Leonardo Martucci. Both were born in Faeto, Foggia. They emigrated to Chicago in 1910. I visited Faeto in 1997 and met several Petittis. Faeto is a truly unique place. Distinti saluti e Dio ti benedica. My parents are going to Foggia and Faeto for their 50th anniversary. My paternal grandfather, a Morrella, was the only sibling of 12 that was born in the USA. Maureen, If you are on Facebook you can find help there under Faeto Libera. There are many English speaking Italians from that area. When we went for my parents 50th we bought an enormous photo print of Faeto from a little private museum. When we were there this last fall, someone in charge had just passed and I don't know who you could contact. Send a message on Facebook, someone can help! golfr44, this is the Faeto home page http://www.comune.faeto.fg.it/cms/home.php there are also facebook pages for Faeto and Celle San Vito, and there are many people on them who have answers. We know that the records from Ellis Island are not accurate. Good luck in your search, and I hope you get to experience Faeto one day! So nice to find your site. I was searching for typical foods of Faeto. My grandmother came from Faeto in early 1900's. I have done a lot of research in the past. Family names from there are Cocco & Nardone. Thanks for the facebook suggestions. My Grandfather came from faeto in 1884 and immigrated to chicago and lived in the taylor street area.He had 11 kids and I`am the youngest of many grandchildren,I`am 51 years old and my name is Bob Petitte. I don`t know the reason he changed the I to an E at the end of our name but his brothers kept it petitti.I remember my father saying our cousins were the martucci`s and the Daddano`s who also came from Faeto.We also had a cousin they called patsy petitti who had a farm in Dundee il. in the 1940`s.One day I will visit Faeto, it looks like a interesting place.If anybody out there has info on the petitti family, or thinks there related to me e-mail me petitte60@comcast.net. 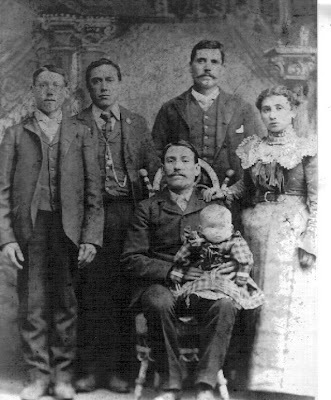 I came across it while searching for my ancestors, the Pavia family. My grandfather was Nicola Pavia. born in Faeto in 1852 (not a misprint, lol). He came to the U.S. late 19th century, settled in Stamford, CT and became a citizen, I believe in 1893. His son, my father, Michael, lived from 1910-1969. Recently I have found many distant relatives and paisani throughout the Fairfield County area. There is an annual Faeto reunion in Newtown, CT where Pavia, Gallucci, DeGirolamo and other Faeto descendants get together this time of year with a fun picnic. All Faeto folks are welcome and encouraged to attend. So I blog about a lot of stuff over at Sweetie Petitti. I get a little feed back from Blogger that tells me what people are hitting with their searches. Apparently Faeto, Italy has brought me a few searchers, and here they found the food I love. And Faeto, Italy again, where they would learn about my trips there and the charm of Faeto and Celle. I am very proud of my Italian hometown. My Grandfather and Great Grandfather as well as my Grandmother all came from this charming mountain village. Another Faeto, Italy post is here with some of those details and a tribute to my dad and his ancestry. Periodically I get a comment from someone who has ancestors from Faeto. The names are familiar from the streets, the cemetery and sometimes the same as mine. Petitti. I have started this new blog in hopes that people will google and get there. I would love to have a meeting place and find family, friends, distant relatives. We hope one day to have a Faeto reunion. Now that would be quite a story! Faeto, Italy. Chances are if you are here reading this, it is because you Googled where your Grandpa, Great Grandma or another relative came from. Welcome, there are many more where you came from. My Grandfather was Pasquale Vito Petitti and he came from Faeto to Chicago. That's where I am now. In Chicago meeting a relative I met through my cooking blog Sweetie Petitti. When I wrote about Faeto, people started sending me messages. So we are going to start convening here. Many years ago in Chicago there was a Faeto picnic, these immigrants were very close to each other. Now, we descendants are all over the map, and we need to pool our info. I'm not sure how this will all work. But I will blog whatever I find. I will scan the photos, the documents and pass along info. My dream is a Faeto picnic in Chicago summer 2012. A chance to meet, share info and celebrate this tiny little town in Puglia that brought us all here. So please bookmark here, come back often and lets see what happens!